Safety is of the utmost importance when homeowners have swimming pools installed at their homes. Installing aluminum fencing with a self-closing, self-latching gate around the perimeter of the pool area. This helps to create an environment that prevents access to the area without adult supervision. Pool safety is of utmost importance. Not only do fences keep pool areas safe their installation is required by the B.O.C.A. Many local communities also have regulations regarding swimming pool fencing. All swimming pools, above and below ground, are required to have a protective barrier installed. The barrier must be at least forty-eight inches tall and be clear of elements around it that would allow someone to get over the fence. Installing an aluminum fence around your pool area also helps prevent people from accessing the pool area unsupervised. Both children, pets, and outsiders will be kept from accessing the swimming pool without an adult and help prevent potential accidents from happening in your yard. Of course, as we have previously discussed, the fencing will help keep your family and friends safe. The fence will ensure that children aren’t able to access the water unsupervised. It offers homeowners an extra feeling of reassurance. Not only does it protect your children from getting into the pool area it also keeps animals from accessing the space. Choose an aluminum fence that is over forty-eight inches tall and aluminum gates that have self-closing and self-latching hardware. Aluminum fencing is also an aesthetically pleasing addition to the swimming pool area. A lot of homeowners worry that installing a fence around the swimming pool will distract from the beauty of the pool area. However, installing an aluminum fence can add to the attractiveness of the area. There are many colors, styles, and options of aluminum fencing to choose from. It doesn’t hurt that aluminum fences are easy to maintain and extremely durable. Installing a metal pool fence helps to limit the liability that homeowners take on with pool ownership. Swimming pool owners assume extra liability for injuries taking place in your pool. An aluminum fence around the perimeter of your pool area is a terrific first step in creating a safe pool environment. This entry was posted in aluminum fencing, Aluminum Gates, metal fences, pet containment, pool safety and tagged aluminum driveway gates, Aluminum fences, aluminum fencing, aluminum gates, aluminum pool fences, aluminum pool gates, aluminum swimming pool fence, metal pool fence, metal pool gates, wholesale aluminum fencing on May 16, 2018 by admin. Puppy pickets can be added to any one of our 18 aluminum fencing style! This entry was posted in pet containment on March 21, 2018 by admin. Add puppy pickets to any style or grade of fence! This entry was posted in aluminum fencing, Aluminum Gates, custom fence options, metal fences, pet containment on February 20, 2018 by admin. Fencing serves four main purposes around your home: dividing up your property from other homeowners, protecting your space from trespassers, giving people privacy from the public, and providing an aesthetic element to your landscaping. Aluminum fencing is one of the easiest ways to serve all four of these purposes at once, as well as provide lasting durability and ease of installation. Since residential aluminum fencing is made primarily from aluminum, it can also resist corrosion and weathering. Often many people will choose residential aluminum fences as they’re available in a wide range of styles. It’s often a lot more affordable than other traditional fencing choices such as steel or wrought iron. Residential aluminum fences are available in a wide range of colors, shapes, and styles. When you’re choosing fencing you may wish to consider creative ways to incorporate aluminum fencing into your landscape. Aluminum fencing to surround a pool. Most backyard pools must be enclosed by a fence due to city bylaws, but it can be expensive to use traditional materials. Residential aluminum fencing is the perfect solution. They come in a variety of styles and colors with automatic latching gates to protect your pool and family. Aluminum fencing to divide properties. A long row of aluminum fencing with decorative points on the top is perfect for separating your property line from the neighbors’ homes on both sides. Residential aluminum fence with a gate to the backyard. You can keep intruders out, but still have access to your backyard through a fence that has a gate in matching color. Install a garden in front of the fencing. This is suitable for areas around the house that don’t require path access. A variety of bushes or flowers can be selected. It’s best to choose shorter plant types that remain below the line of the top of the fence. Residential aluminum fences that follow a path. A small path of stones or concrete can follow the fence around the house. This path can lead to a gate at the front, back, or sides of the property. It gives people a chance to keep their feet clean as they traverse around the property, and an aesthetic touch that makes the garden look attractive. To frame a garden. Residential aluminum fencing can be used to create a square or rectangular space in the garden where you can safely plant your fruit or vegetable garden. The fence serves the purpose of keeping wildlife and intruders out so that your garden remains untouched until you’re ready to cultivate it. Residential aluminum fencing is one of the best choices for your residence. It can be used for a variety of different purposes, and is more affordable than solid wood or steel. And aluminum is a much better option for when you’re on a tight budget, but really wish to have that fence around the perimeter of your home. Installation is quick and easy. With the addition of a brand new residential aluminum fence your house will quickly become a home. This entry was posted in aluminum fencing, Aluminum Gates, Driveway Gates, Gate Hardware, metal fences, pet containment, pool safety and tagged Aluminum fences, Backyard Fencing, Residential Aluminum Fences on January 17, 2018 by admin. This entry was posted in aluminum fencing, Aluminum Gates, custom fence options, Driveway Gates, metal fences, pet containment and tagged aluminum fence, Aluminum fences, aluminum gates, aluminum pool fence, Backyard Fencing, metal pool fence, Metal Pool Fences, pool fences, Residential Aluminum Fences, residential fencing, wholesale aluminum fencing on October 30, 2017 by admin. Aluminum fences are made and constructed from a metal called aluminum which has recently gained a lot of popularity because of its incredible properties and low maintenance charges. Aluminum fences are made in a wide range of sizes and shapes. They come in many different colors, which are applied using a powder coating. The coating is applied through an electrostatic process and cured under heat to form a strong smooth surface. The powder coating stick to to aluminum better than paint or other coatings. It has the ability to withstand harsh conditions including extreme heat and cold. Its weather resistant quality leads many manufacturers to offer very long warranties, from decades up to “lifetime” for some brands. Aluminum fence materials are often in the form of rigid rails or posts, but flexible forms are also used. Aluminum fences are made in multiple grades ranging from light weight residential to heavy weight industrial. A few years ago aluminum fences were not very well-known and popular in the residential world and they were thought to be expensive too but now they have become the choice of everyone. They have become the perfect investment of money as they will never wrought like iron and are not expensive like steel. They are a perfect choice for every home and for every office and guess what they are perfect for commercial uses too. Aluminum fences will cost you more than other fences at first but in the long run they will save you a lot of money as they are easy to install, they need very low maintenance and the best thing about them is they are totally repellent to rust even if you keep them dipped in water. On the other hand a wood or vinyl or iron fence will require regular maintenance and upkeep. Besides being decorative and cost effective Aluminum fences are incredibly strong too. They are designed to with stand strong winds, and thieves and burglars. Aluminum fences will never change the look and appearance of your property but these fences will ensure that you are always secure and protected when inside these fences. Aluminum fences are a good option if your budget is limited. It will work to keep burglars out or dissuade them from crossing the barrier into the property. Aluminum fences are general purpose fences and they serve a lot of purposes. You can install them anywhere they can be used as security fences, pet fences, residential fences, and for commercial and industrial applications. It is best used for aesthetic purposes, such as residential garden, yard or pool fencing. Its opposition to corrosion makes it the ideal choice for seaside or waterside homes in particular. Aluminum fences are an ideal solution for every problem though decorative or security they are fit for every use and for every place. Aluminum fences are a perfect investment of money which lasts longer than the expected period of time saving the installer a lot of money. This entry was posted in Aluminum Deck Railing, aluminum fencing, custom fence options, metal fences, pet containment, pool safety, Wholesale Aluminum Fencing and tagged aluminum driveway gates, aluminum fence, Aluminum fences, aluminum fencing, aluminum pool fencing, aluminum pool gates, aluminum swimming pool fence, metal pool fence, residential fencing, wholesale aluminum fencing on April 28, 2017 by admin. There are many decisions to make when deciding on what type of fence you would like to install at your home. A fence’s main purpose is to add security but won’t cost a fortune for your improvement budget. One of those many choices is an aluminum fence which can offer many styles and colors that can fit your unique vision of a design. Once deciding on an aluminum fence, learn some pointers on the best tips to use in order to have a successful fencing install. No matter where you are located, each area has its own type of fencing that is permitted. Make sure to check that you are in the boundaries for height restrictions and if there are any boundary regulations. Depending on the location, some locations require you to offset the fence post away from the property line by a certain distance but others can allow the post on the property line. If you are uncertain where your property line exists, you can have a survey done for you to help understand where the line exists. Also, another set of information to verify not only with local zoning is with your Homeowner’s Association (HOA). Some of them may have very strict regulations as to what type or color of fence is installed on your property. Before starting your project it is of high importance to always call “Miss Utility” before you begin digging. Many do- it-yourselfers do not remember to take this precaution and end up in trouble during the install. In many cases, one third of a fence height has to be dug underground. With an aluminum fence, gate posts should be at least 30 inches below ground. There are many hazards beneath the ground that you do not want to take the chance of hitting a pipe or wire. To save yourself from one large headache, please take the time to make one quick phone call that could save you a lot of stress in the long run. There are three types of ratings for aluminum fences that many are not aware of. It is important to decide between the strength of residential, commercial, or industrial. In special cases, there has even been ‘Heavy Industrial’ design created. If you would like to learn more about these three ratings you can view Alumni-Guard’s website, which provides great information about the Cads and Specs for each rating separately. The consumer must think hard about what the purpose of this fence will be used for, a residential fence for example may not be the best option if the fence will be heavily “used” by a person’s animals and kids. Before beginning to build the actual fence, make sure to lay out your plan for the fence physically on the ground so that you can see what the fence will look like when completed. We recommend using inexpensive string and use stakes for the corners to remember where you will have to dig holes at for posts of the fence. Many of people forget to do this step and will come across larger obstacles than they had imagined because someone forgot for example about a big rock or tree that is in the way of where fence wanted to be installed. It is very important to designate a place for each of the fence posts. The simplest way of doing this would be to place a “X” using paint but be sure to measure your placement and spacing correctly. Many people make the mistake of just eye-balling pole locations and this error will cause further problems including further expenses and time when it’s time to actually install the fence. When using the paint mark, it will need to show the actual center of where the fence post will be so it is helpful to know the post measurements before placing the paint mark on ground. Being cautious to not mix and match the posts because Aluminum fence posts are pre-punched to be a certain type such as corner, in-line or end posts for the gate. The first thing to do in the project is the gate posts. When building wood fences, you have the ability to make alterations during the installation but because when installing aluminum fences, the posts are pre-punched and the rails fit tightly together. By starting with the gate posts it will help eliminate problems with measuring or strange entry locations. Also when installing an aluminum fence the gate posts need to be dug deeper than a different type of fence post because the posts have quite a bit of weight attached to the post compared to other fences. If making the mistake of digging the hole for the post to shallow, the process and maintenance in years to come will have to be repeated frequently so it is best to do it right the first time and dig the hole appropriately in depth. A suggestion from aluminum fence specialist is to dig a depth of 30″ for gates over 96″. With smaller gates you may only have to dig a depth of 24″. Aluminum fences can be mounted to concrete however; there are things to remember when working with concrete. First, your fence posts need to be anchored properly because normal wear and tear on daily basis could lead the fence to weaken and sag overtime. To install aluminum fence to a concrete surface the simplest way is to use a floor flange for each post. A person can bolt down into the concrete, add the post and then finish securing it. Secondly, keep in mind to allow the concrete to dry completely before ongoing your installation. It is key to be patient when installing an aluminum fence, rushing the process will only make things worse. It may take up to three days for the concrete to dry completely but that is much less time than it will take to redo sections of the fence or possibly even having to redo the whole thing! If you follow these simple seven steps, your installation should hopefully go fairly smooth. 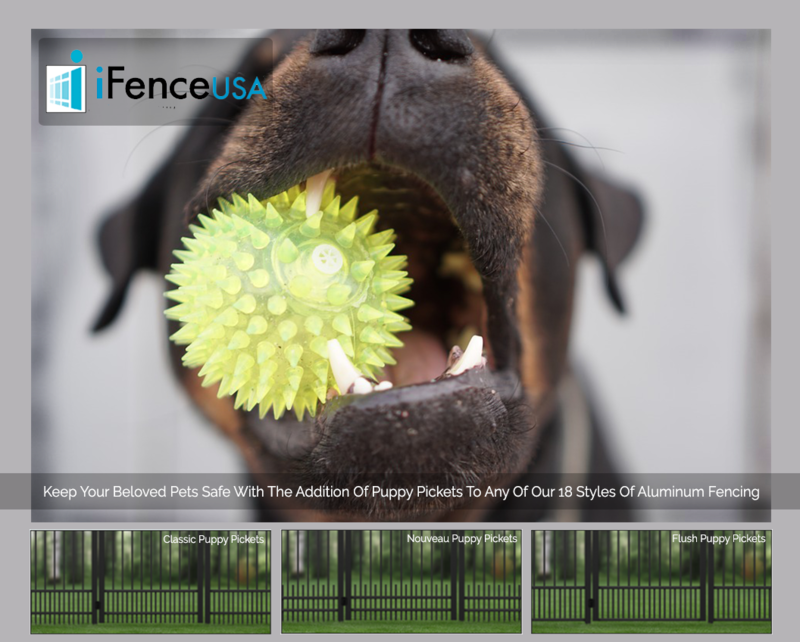 This entry was posted in aluminum fencing, metal fences, pet containment, pool safety, Wholesale Aluminum Fencing and tagged aluminum driveway gates, aluminum fence, Aluminum fences, aluminum fencing, aluminum pool fencing, aluminum pool gates, aluminum swimming pool fence, metal pool fence, residential fencing, wholesale aluminum fencing on February 28, 2017 by admin. In our last installment on aluminum fencing we began to discuss crucial steps to take before plunging into the installation process. We previously discussed why it is important, even ordering a new fence, to find out regulations placed on fencing by your local government and HOA. This will prevent you from ordering a material, height or color fencing that doesn’t meet the regulations set forth. Verifying underground utilities and choosing the correct grade of fence for your installation are both other suggestions that were made to ensure success. Here are a few more pieces of advice and tips to ensure success when installing aluminum fencing. Before you start digging any holes map out the perimeter of the fence. This will allow you a visual map of the perimeter of the fence. Take time to stake off where the holes for the fence posts need to be even better prepared come time for the actual installation. This process helps prevent odd fencing configurations. It allows you to account for the big tree or huge rock that is in the way of the fencing before you find yourself having to make last minute changes to account for them. As previously mentioned, it can save a ton of time if you stake off the location of the fence posts prior to installing your aluminum fence. During this process, before digging any holes, you can measure the space between the poles a number of times to ensure accuracy. There isn’t room for error when measuring out the location of aluminum fencing posts simply because the posts come pre-punched and the fence panels come in specific, pre-assembled sizes. When installing an aluminum fence it is important to begin the installation with the gate posts. The gate posts are pre-drilled as are the fence posts and the rails are meant to fit sung. The margin for error in this process is small. It is crucial to measure and then re-measure to guarantee accuracy. Remember that the gate posts must also be dug further down into the ground then regular fence posts. When installing an aluminum fence, patience is needed. Don’t try to cut corners or rush through the installation process. If you use concrete when setting the posts it is crucial that it has time to thoroughly dry. This will help prevent any give the fence may have as it settles. Too much give will impact the performance of the fence. The installation of your aluminum fence is sure to be successful if you follow the advice above. This entry was posted in aluminum fencing, custom fence options, metal fences, pet containment, pool safety and tagged aluminum driveway gates, aluminum fence, Aluminum fences, aluminum fencing, aluminum pool fencing, aluminum pool gates, aluminum swimming pool fence, metal pool fence, residential fencing, wholesale aluminum fencing on February 17, 2017 by admin.